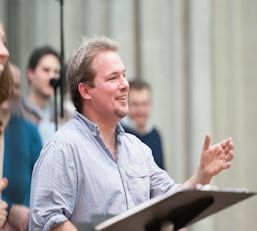 Robert Murray studied at the Royal College of Music and the National Opera Studio. He won second prize in the Kathleen Ferrier awards 2003 and was a Jette Parker Young Artist at the Royal Opera House Covent Garden. Operatic roles at the Royal Opera House include Tamino (‘Die Zauberflote’), Lysander (‘A Midsummer Night’s Dream’), Agenore (‘Il re Pastore’), Belfiore (‘La Finta Giardiniera’), Jacquino (‘Fidelio’) and Don Ottavio (‘Don Giovanni’). Other roles include the title role in ‘Albert Herring’ for Glyndebourne On Tour; Nanki-Poo, Tamino, Don Ottavio and Idamante for English National Opera and Tom Rakewell (‘The Rake’s Progress’) for Garsington Opera. Concert work includes Haydn’s Nelson Mass with Sir John Eliot Gardiner for the BBC Proms; Handel’s ‘Solomon’ with the Norddeutscher Rundfunk in Hamburg; Mozart’s C Minor Mass both with the City of Birmingham Symphony Orchestra under Sir Charles Mackerras, and with Le Concert D’Astrée; Britten’s War Requiem with Simone Young and Britten’s ‘Our Hunting Fathers’ with Thomas Adès at the Aldeburgh Festival; Strauss’s ‘Elektra’ with the Royal Scottish National Orchestra and Edward Gardner, Schumann’s ‘Manfred’ with the BBC Scottish Symphony Orchestra and Ilan Volkov at the Edinburgh Festival and ‘Tristan und Isolde’ with the Rotterdam Philharmonic and Valery Gergiev. Fantasio is Robert’s first recording with Opera Rara.